I couldn't imagine anything about giant snail racing. 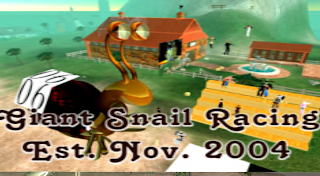 I visited the usual racing track, where the weekly sunday race normally takes place 11 AM SLT- now saturday races for the slower snails are added at 9 AM SLT with dancing afterwards the race - and got myself a snail costume. Fitting it the first time, I nearly fainted, looking at me now a snail as big as a house. The following sunday I crashed into a special race - once a month the snail race travels to a themed space for the sunday race and snails as well can dres sup especially for that theme. That day I found myself at the cruiser SS Galaxy. My Snail head was four decks higher than my snail foot and navigating through the cruiser was a quest. It was one of the most fun expeirences I ever made at SL, even if I totally sucked within the race. Mostly it's one hour too early for me at sundays, so I sob a bit each sunday the race starts without me. But I recommend to all of you to try and enjoy the fun of being a giant snail in a racing competition. Nadja Revnik: When and how did you get the idea of giant snail races? RacerX Gullwing: Oh, I saw an event comming up in a few days that was calling itself the giant avatar contest. So I went to work trying to make the biggest avatar I could and a one footed avatar seemed the best option. Anyway I lost. I was the only one that took it literally. It meant many avatars not huge ones.Nadja Revnik: Oh, hehe. RacerX Gullwing: Then we were trying to help Montmartre raise cash. That's when they paid for traffic. Catfart my neeghbor thought I ought to do a snail race. So I started that up. The snails are still free, but now you can get a full perm version. You can go crazy modding. RacerX Gullwing: That's the condenced version. Nadja Revnik: And the usual race track is around one sim? RacerX Gullwing: It was around Montmartre, but that's been renamed the Eternal now. But yes, we had it there and the sims next door to that for the first 5 years. We also did one on tuesday nights in Hawthorne. Nadja Revnik: You do that for 5 years already? RacerX Gullwing: When it was an Amy Webber build called chases manhattan. We're working on 7 now. RacerX Gullwing: 6th birthday was last month. Nadja Revnik: Wow. Great, thats a long time! 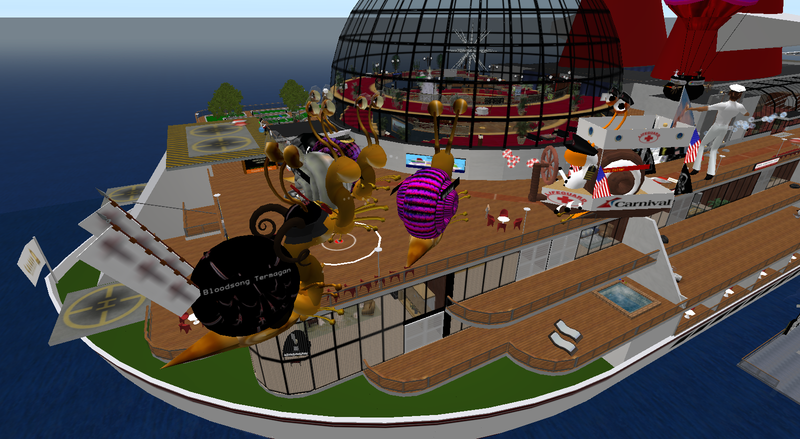 RacerX Gullwing: I think we're the longest running weekly event in SL. Nadja Revnik: Wow! You still sell pimpable snails? RacerX Gullwing: Totally get one at the track: the free one. There's only one script in the shell we don't let you mod. Nadja Revnik: And how long does the avarage race take? Are it different tracks each sunday? I was just once at that ship by now. RacerX Gullwing: Around 10 -15 minutes. Nadja Revnik: And the track? Is modified or same? RacerX Gullwing: No, basically the same track every week we use for the championship. But once a month we take the snails on a field trip to other sims for fun races. Nadja Revnik: Ok, so the more races you take at the same route the better you might get. RacerX Gullwing: The track is slowly evolving. Right now it's in the midst of a texture change. But that doesn't effect the track. The key to snail racing is practice. Nadja Revnik: I guess so...I found out changing the cam perspective from time to time helps finding the way. Plus the knowledge where your real body is hidden. RacerX Gullwing: If you can get your time down to 0.35 or so per lap you are doing super. 3 rounds = race. Time's around the track.Nadja Revnik: Per lap? /comment A lap is one round. RacerX Gullwing: Yeah, that might be a little impossible, but that used to be what they were shooting for. Nadja Revnik: So you are the head of the snail races and waelya is a trainer? RacerX Gullwing: Yes, waeyla is my invaluable assitant to the bunny. /comment Racer X usually wears a bunny costume. RacerX Gullwing: She chases the newbies around, trying to make them try snail racing on the first or second day here and does a lot of the paperwork on the fly during the races and also corals them up ready for starting. Nadja Revnik: Great! I got the hint from a sports reporter, when I started my research for the sports series at my blog. RacerX Gullwing: Well, word of mouth was all we had for years and then treet showed up and we really picked up. Then the track had to look better. /comment Treet TV is reporting on Giant Snail Races Weekly. RacerX Gullwing: You need a high speed conection and a good PC to race, but anyone can watch just go easy on the bling. Nadja Revnik: Well, I enjoyed participating in the race on the ship. RacerX Gullwing: That was crazy! We never had so many things go wrong on that, but still got enough of it filmed to make it a race. You can always catch the reruns at http://treet.tv/shows/snailraces a day or 2 after the races. RacerX Gullwing: Yes, well, we've been getting a lot of visitors since the Lindens listed u,s so could be crazy busy soon there. We're up 5 times usual right now in traffic. RacerX Gullwing: I think it was a good interview! Nadja Revnik: Thank you so much for your time. All news about the Giant Snail Races on the Snail Race Blog.